Last valentine's day, I received a parcel containing a DVD among a few other items. It is a movie entitled "Sliding Doors" which I decided to watch the monday after, after it was recommended to me. It stars gwyneth paltrow and john hannah, revolves around the life of Gwyneth paltrow, at that particular moment, what would happen next should she missed/taken the train back home. The movie is set in 2 parallel universes, the consequence of the train incident. It has always been a question in one's mind as to what would happen if do/don't do something. Correct me if I'm wrong; we always think "oh if only I didn't mark "A" on the exam sheet" or "If only I sms-ed her" cos we always contemplate about our decisions. And this movie explains it in the perspective of Gwyneth Paltrow's life after the train incident. The story line moves about a-la Robert Frost's The road not taken. As much as we would imagine but will never realize what would happen, obviously because time moves forward and not backwards, this movie brings us through at its best gwyneth paltrow's parallel universe and the different people she will meet and end up with. Well unless we venture into rocket science, i guess its hard for us to reconcile the events in both universes. But Gwyneth Paltrow certainly gave a stellar performance in her effort to make ends meet in both universes while john hannah played the love interest who would be her lover only if she did not miss the train. The ending in both universes were really soothing, in the line where she missed the train, she eventually met John Hannah, whom she quoted his favourite phrase and sort of sparked a dejavu (of the other universe). In the other universe, John Hannah promised happiness to her all his life. The funny and interesting moral of the movie is IMHO, that while some things are meant to be known, some things are not, sometimes, no matter what happens to us, it will lead to the same consequences. Just like the Bangkok incident. 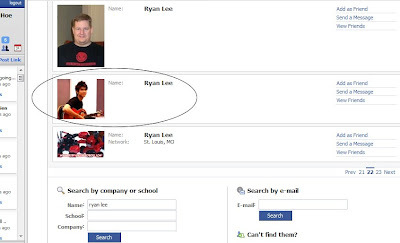 This may sound funny to you, but there is a guy in facebook, with the screen name Ryan Lee, who uses my photo on his profile. I was informed about this by my gym mate, who told me she received a message from me but with a different name. I told her I go by Julian Chow and not any name and that my profile pic is a caricature of myself. She said she remember seeing my picture of me holding a guitar and got me curious. She showed me and to my dismay, he has not only one, but a whole bunch of my photos in his profile photos, which I could clearly identify they come from my friendster page. The saddest thing about this is: He has MORE friends than I do. Now everyone in the gym calls me Ryan Lee. Ok, this issue needs to be addressed as I am Julian Chow and not Ryan Lee! Damn it! Now I can call someone a freaking Poseur! Hah! If he/she happens to be your friend, please on behalf of me, ask why this is happening. Thank you! Sunday is the day we decided to have home cooked dinner session every weekend we're around. 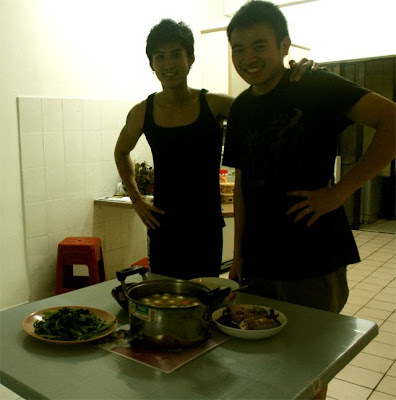 And Feb 15 2009 marks the day, the Bros decided to have the first cooking session, Jamie oliver style. But what can I say? It's a job well done and we're proud! FD: "Yeah, and they must think 'what are those two idiots doing so excited about cooking? ', they have already cooked for so long they can't be bothered anymore and these two guys are enjoying and taking photos??" I am thinking is it the "Bin Tai Lou" that we always met in MMU Library?